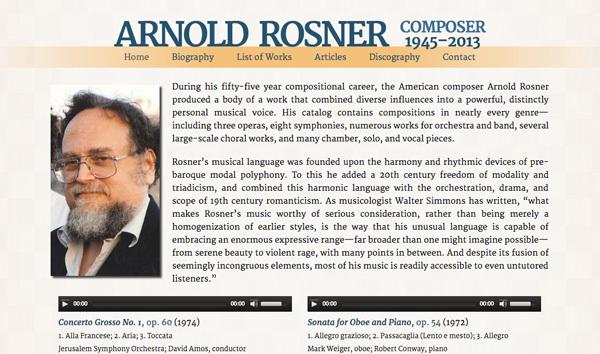 The Challenge: Arnold Rosner (1945—2013) was an American composer, and his estate wanted to create a site that would preserve his legacy and house his composition portfolio. The Solution: This is the first site that has featured a custom installation of my Composition Manager plugin for WordPress. The plugin creates a new composition object in WordPress, which can save composition data like movements, scores, dedications, recordings, premieres, program notes, etc. The site also allows anyone to easily searching Rosner's catalogue by genre or instrument and request perusal scores.